I make these Blueberry Muffins a lot during the summer months when fresh blueberries are in season. They are always quick to disapper. I enjoy their moist and almost bread-like texture, and how the only flavor competing with the blueberries is vanilla. If fresh blueberries aren't available, you can use frozen, and I especially like to use the frozen wild blueberries. 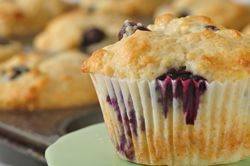 This Blueberry Muffin batter is different than the Blueberry Streusel Muffin recipe on the site, in that oil is used instead of butter, and plain yogurt is used instead of milk. It is the oil and yogurt that make a muffin that is wonderfully moist and bread like. I love how quickly the batter for these muffins can be put together. Dry ingredients are mixed together in one bowl, wet ingredients in another. Mix the two together and you are done. When folding in the blueberries, especially if you are using frozen blueberries (do not thaw the frozen blueberries), have a light hand as you do not want the blueberries to crush and stain the batter blue. You might want to try this recipe using other berries like blackberries, raspberries, or even chopped cranberries. And if you would like a citrus flavor, add a teaspoon of grated lemon or orange zest (rind) to the batter. Now, the muffin tins need to be either lightly buttered (can spray with a non stick vegetable spray) or lined with paper liners. My preference is to use paper liners since it makes cleanup a snap and I also like how pretty they look. Make sure to fill each muffin cup full with batter as these muffins rise very little. When you pull these muffins from the oven their golden brown crust is delightfully crisp while inside they are moist and tender (almost bread-like) and bursting with blueberries. I think this is when they are at their best. But still, even though their crusts may soften once they are covered and stored, their moist texture and delicious flavor remain intact. Evenly fill the muffin cups with the batter, using two spoons or an ice cream scoop. Place in the oven and bake for about 15 - 20 minutes or until a toothpick inserted in the center of a muffin just comes out clean. Transfer to a wire rack and let cool for about 10 minutes before removing from pan.